The Cerebral Palsy Research Network (CPRN) is excited to have its first published research manuscript. Setting a Patient-Centered Research Agenda for Cerebral Palsy is available in Developmental Medicine and Child Neurology. And even better it is open to the public free-of-charge so that it is available to all in the CP community! Research CP, an initiative to set a patient-centered research agenda for cerebral palsy (CP), is a collaboration between CPRN and CP NOW, a nonprofit focused on education and research for people and families living with CP. 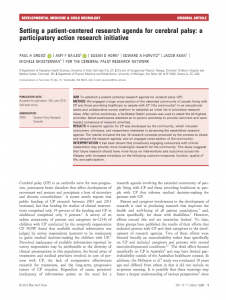 Research CP started in March 2017 with a series of educational webinars, online polls to establish a research agenda and culminated in a face-to-face workshop in Chicago, Illinois in June 2017. Other topics including Pain, Neuroplasticity and Quality of Life. You participated in Research CP. Please tell us what you think of the paper and help us get the word out to other people with CP, their caregivers and to clinician researchers. Michele and I are planning Research CP 2.0. This will kick off with a review of the existing agenda and a discussion about how to not only move that research forward but also how to develop a more specific agenda for some of the underserved research questions. Stay tuned for details!